The St. Pete Times has another lengthy expose of David Miscavige’s brutal treatment of his underlings. They are stepping forward — from Dallas and Denver, Portland, Las Vegas, Montana — talking about what happened, to them and their friends, during their years in the Church of Scientology. Jackie Wolff wept as she recalled the chaotic night she was ordered to stand at a microphone in the mess hall and confess her “crimes” in front of 300 fellow workers, many jeering and heckling her. These and other former Scientology staffers are talking now, inspired and emboldened by the raw revelations of four defectors from the church’s executive ranks who broke years of silence in stories published recently by the St. Petersburg Times. Those who talked confirm the earlier defectors’ stories of erratic, dehumanizing treatment and provide a deeper view into the controlling environment in which members of the religious order known as the Sea Org live and work. A few days ago, Miscavige distributed a special Freedom Magazine issue smearing the four people who spoke out in the first St. pete Times articles. He’d better crank out the next issue fast before the villagers chase him down with pitchforks and torches. Slappy sees the end draw near. Talk about flaps. David Miscavige must be packing his bags to go live in that cave with Osama Bin Laden. Marty Rathbun is spilling the beans. Two other former executives who defected also agreed to interviews with the St. Petersburg Times: De Vocht, who for years oversaw the church’s spiritual headquarters in Clearwater, and Amy Scobee, who helped create Scientology’s celebrity network, which caters to the likes of John Travolta and Tom Cruise. One by one, the four defectors walked away from the only life they knew. That Rathbun and Rinder are speaking out is a stunning reversal because they were among Miscavige’s closest associates, Haldeman and Ehrlichman to his Nixon. Now they provide an unprecedented look inside the upper reaches of the tightly controlled organization. There’s terrific video, too. Go and read. Watch. It’s Miscavige’s nightmare coming true. The second installment covers the Lisa McPherson case. Rathbun admits he ordered the destruction of evidence. And creepy new revelations that not only are auditing sessions videotaped, but David Miscavige can watch the seesions live any time he chooses. Do the parishioners find this unsettling? Or will they simply excuse it as they have so many other abuses? The Church of Scientology in France went on trial today on charges of organised fraud. Registered as a religion in the United States, with celebrity members such as actors Tom Cruise and John Travolta, Scientology enjoys no such legal protection in France and has faced repeated accusations of being a money-making cult. The group’s Paris headquarters and bookshop are defendants in the case. If found guilty, they could be fined €5 million ($7 million) and ordered to halt their activities in France. Seven leading French Scientology members are also in the dock. Some are charged with illegally practising as pharmacists and face up to 10 years in prison and hefty fines. The case centres on a complaint made in 1998 by a woman who said she was enrolled into Scientology after members approached her in the street and persuaded her to do a personality test. In the following months, she paid more than €21,000 for books, “purification packs” of vitamins, sauna sessions and an “e-meter” to measure her spiritual progress, she said. Other complaints then surfaced. The five original plaintiffs – three of whom withdrew after reaching a financial settlement with the Church of Scientology – said they spent up to hundreds of thousands of euros on similar tests and cures. They told investigators that Scientology members harassed them with phone calls and nightly visits to cajole them into paying their bills or taking out bank loans. The plaintiffs were described as “vulnerable” by psychological experts in the case. Scientology, founded in 1954 by science fiction writer L Ron Hubbard, describes the “e-meter” as a religious artefact that helps the user and supervisor locate spiritual distress. Investigators have described the machine as useless and said vitamin cures handed out by Church members were medication that should not have been freely sold. Judge Jean-Christophe Hullin ruled last year that the offices and members, including the group’s 60-year-old French head, Alain Rosenberg, should be tried. The public prosecutor had recommended the case be shelved. In a trial that has revived a debate about religious freedom in secular France, the defence is expected to argue the court should not intervene in religious affairs. 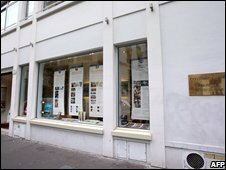 Scientology has faced numerous setbacks in France, with members convicted of fraud in Lyon in 1997 and Marseille in 1999. In 2002, a court fined it for violating privacy laws and said it could be dissolved if involved in similar cases. The headquarters and bookshop account for most of the group’s activities in France and a guilty verdict would in practice mean its dissolution, although it is unclear whether it could still open other branches in the future. Palin Pallin’ with an OT? You Betcha! Last week, it was all over the blogs that Sarah’s Palin’s brain trust for the 2012 election included big-time Scientologist, Washington D.C. insider and husband of Greta Van Susteran, John Coale. The Washington Post’s Chris Cillizza broke the story and since then, Gawker has been all over it like fur on a weasel. Whenever a new president got elected, I would always tell myself, “How much harm could they do?” They’d be there 4 or 8 years and then move on. But during his term in office, George Bush managed to break the world. I see Sarah Palin as Bush in a dress, his ideological twin, making decisions by the gut. I can’t imagine what would have happened if Bush had a Scientologist at his side. And for those who don’t want me to mention politics, this time it’s inescapable…and, boy, am I holding back. This is why we need newspapers. Reporters like Julia Glick from the Riverside Press-Enterprise do us all a favor when they bring to light the unethical behavior of local politicians like Riverside County Supervisor Jeff Stone who touts his sister as a volunteer for the county, yet last year he paid her $40,000 more out of campaign funds than he made as a County Supervisor. Supervisor Jeff Stone frequently praises his sister as Riverside County’s best bargain because she works full-time as an unpaid volunteer in his office. But records show he paid Lori Stone more than $180,000 in campaign money last year for political consulting and professional services and he assigned her the free use of a county car with taxpayer-funded gasoline included. Over the past three years, Stone’s campaign payments to his sister totaled about $330,000. In reporting this story, The Press-Enterprise tried to interview Lori Stone and another staff member. Jeff Stone directed them not to comment and asked that requests be referred to him. Jeff Stone has been shilling for Scientology but his days may be numbered. In this time of outrage over AIG bonuses, do we really want to hear that a politician’s sister gets paid $181,000 for “volunteering” and is given a free vehicle and gas courtesy of the taxpayers? That’s not volunteering, Mr. Stone. And you’re no representative of the people.